1 Preheat oven to 450°. Arrange pork in shallow roasting pan on rack and season with garlic salt. Roast 20 minutes. Decrease heat to 350° and continue roasting 1 hour or until meat thermometer inserted in center reaches 160°. Remove pork and keep warm; reserve pan drippings. 2 Meanwhile, for sauce, heat oil in 10-inch skillet over medium heat and cook onion, stirring occasionally, 2 minutes. Add peppers and cook, stirring occasionally, 3 minutes or until onion and peppers are tender. Stir in reserved pan drippings and cook 1 minute; remove from heat. Stir in Hellmann's® or Best Foods® Mayonnaise with Lime Juice, cream and cilantro. Season, if desired, with additional garlic salt. 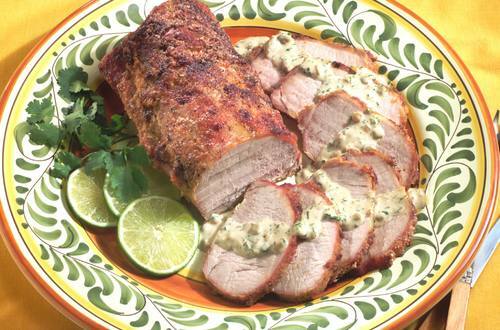 To serve, slice pork and serve with poblano chile sauce.